Choosing first grade reading books can sometimes be a challenging experience. Knowing your child's interests and being willing to spend some time browsing at the local library will help make the task easier. Proactive Parent has an extensive listing of suggested reading materials for first grade students, broken down into reading level. There is also a list of books that first graders may enjoy having a parent or older sibling read aloud to them. Hedgehog Books, a resource created by teachers to help parents choose reading materials for their children, has many suggestions for first grade reading books. Books in the Classroom includes reviews of many books suitable for first grade readers. Obviously, your child's teacher is another great resource for choosing age-appropriate reading materials. Ask for a list of what books your child will be reading in school, as well as suggestions for supplemental reading materials you can add to your home library. Encouraging a love of reading is one of the best things you can do for your child. Students who read well in the lower elementary grades will have a much easier time mastering the challenges of junior high, high school, and college level coursework. Allow your child to choose reading materials that match his interests. Even if the subject matter isn't what you'd prefer, it's important that your child practice reading as much as possible. Set a good example. Let your child see you reading for pleasure and make going to the library to choose new books an activity that the whole family takes part in. Provide access to a dictionary so your child can look up unfamiliar words. 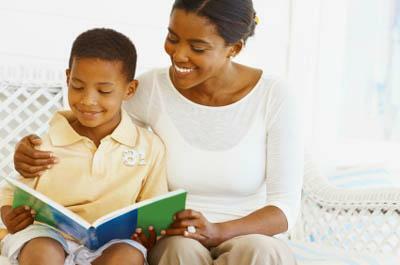 Encourage your child to talk about what he is reading. Share some of your memories of your favorite books at that age.